Mark Zuckerberg yesterday announced Facebook ads, a new ad system which will allow advertisers to take advantage of recommendations from Facebook users. Under the new system, advertisers can create profile pages on the social network with applications and content related to the company’s product or service, while users can add these brands as ‘fans’. Once users have connected with an advertiser’s profile page, they can share information about that business with their contacts, as well as adding reviews, and interacting with the profile page. Advertisers can then use these interactions as the basis for Social Ads, which Facebook can distribute to users’ contacts based on various criteria. These Social Ads will then appear in end users’ news feeds as product and service recommendations, while ads can also appear on users’ profile pages. Facebook will also provide ‘Insights’, which will allow advertisers to data on user activity, demographics, ad performance and trends. Users will be concerned about how this latest targeted ad system will affect their privacy, though users will be able to turn off these social ads, and Facebook insists that no personally identifiable information will be shared with advertisers when creating social ads. With each Facebook member seeing just two ads per day, supply of the new ads may be scarce, pushing prices up for advertisers. Ads will be sold via an auction based platform. Advertisers need Facebook users to add themselves as ‘fans’, so brands will need to work hard to coax users to their product’s profile pages. Travel group Saga has launched a social network aimed exclusively at the over 50s. 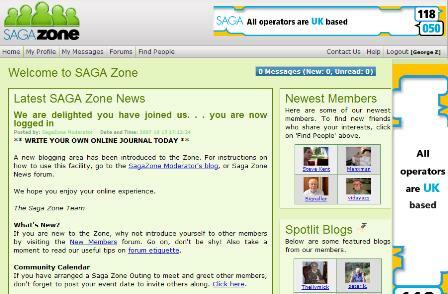 SagaZone, as it is called, features profile pages, forums and blogs for its members.